Moving this heavy planting is no problem when you've got a pair of wheels tastefully concealed. It's a gardener's puzzle in some corner of practically every back yard in America: How to hide that unattractive bit of space where you keep the garden hose, or the ugly imperfection in the wall, or you name it. Paul recently demonstrated an easy-to-build solution to this problem that also has the benefit of making your heavy planter box mobile. Paul frames the entire lattice with mitered 2x4s for added stability. 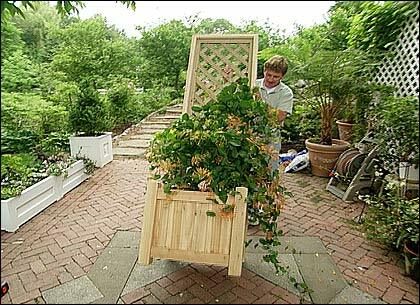 Taking one of the heavy-duty white cedar planters at the Victory Garden, he attached a tall wooden lattice to the back and put two casters on the bottom. The end product: a large and attractive screen on wheels. What's more, constructing the contraption is fairly simple. 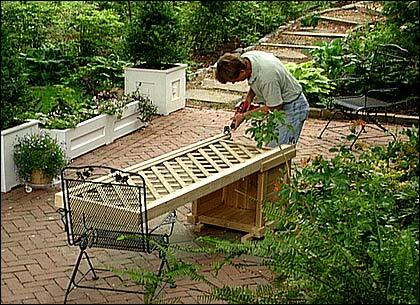 Start with a wooden planter box, which will need to be empty for this process, and a piece of 1/2-inch lattice (which is much sturdier than 1/4-inch), as tall as you like and equal in width to your planter. You'll also need heavy-duty deck screws, two galvanized caster assemblies and a screwdriver (preferably a cordless drill). Two casters attached at the back, rather than four on the bottom, allow you to move the planter by tipping it backwards, and keep the wheels hidden when it's at rest. Paul framed his lattice with 2x4s to lend it the additional strength it needs. He then attached casters to the bottom rear of the lattice frame and screwed the whole construction to the back of the planter. In this way the lattice can act as the arms of a dolly, allowing you to tip the entire apparatus back and roll it around on the casters whenever you need to, even when it's planted to full capacity. At rest, the planter looks nice and permanent, sitting on its regular base with the wheels hidden behind. 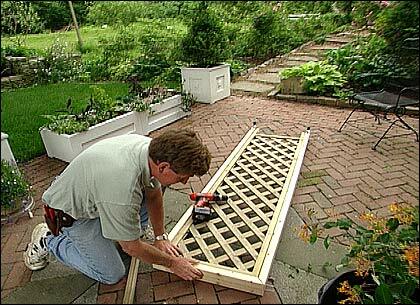 A planting of your choice will grow up the trellis and create a beautiful screen for whatever you want to stand it in front of. And all in a Saturday's work! This segment appears in show #2715.